To piggyback on our commitments in London and our cruise through Norway, we chose to spend just over a month traveling through parts of Western Europe. Both of us have been to a number of Western European countries so we didn't feel obligated to spend a lot of time there. We were picky about our destinations and chose to do what we love - drink beer in Belgium, wine taste in France and spend time in the sun in Portugal. Our hope was to get through it relatively unscathed budget-wise by limiting our time in pricier countries like France and spending more days and fewer Euros in places like Portugal. We spent five days in Belgium between Brussles and Ghent, nine days in France between Paris and the Alsace and Burgundy wine regions, then 18 days in Portugal touring the country from north to south. As with most things in life, our budget balanced out over the course of these 32 days and we ended at a shockingly low $119 per day across all three countries thanks to our extended time in budget-friendly Portugal. Belgium Belgium has so much to offer and at a decent value. We found lodging to be relatively reasonable by renting apartments in both Brussels and Ghent and we could feast on Belgian snacks all day, which were really inexpensive. Per usual, our biggest expenses outside of lodging was our beer consumption. We landed right at $125.75 per day over the course of five days in Belgium. France We expected France to be a budget-buster and while we spent more per day than our $125 budget, we really did well after doing a lot of research to find deals on everything from accommodations to tourist attractions in Paris. Outside of our train travel costs within the country (while it gets you places quickly, the TGV train can be expensive), we came out at $131 per day. A huge win for two people who have serious wine drinking habits. Fortunately, they make enough wine in France to satisfy all price points. Portugal Touted as one of the most affordable countries in Western Europe, Portugal lived up to the hype. From value accommodations to cheap inter-country bus and train travel, we came in at $112 a day over the course of 18 days in the country. There are ways to blow the budget in Portugal, but there really isn't a need given the options available. Our average cost would have been lower, but we decided to splurge on a hotel for a few days following our three-day hike along the Southern Portugal coast. We spent $3,826 during 32 days in Western Europe for a per day average of $119. We're still amazed we managed to stay on budget. Our biggest expense outside of food and lodging was our travel between countries. We spent an additional $1,000 taking the Eurostar from London to Brussels, hopping trains across France and flying from Paris to Porto. While getting around Europe is easy, it isn't always cheap. We stayed in a variety of places across all three countries to try and find value accommodations. Our least expensive place was two free nights in a Lisbon apartment thanks to our friends, while our most expensive was a splurge on a $100 a night B&B at the end of our multi-day hike in Portugal. Our cute hotel in Eguisheim, France. We rented mainly studio apartments, which were typically in the $60-$80 range depending on what city we were in. 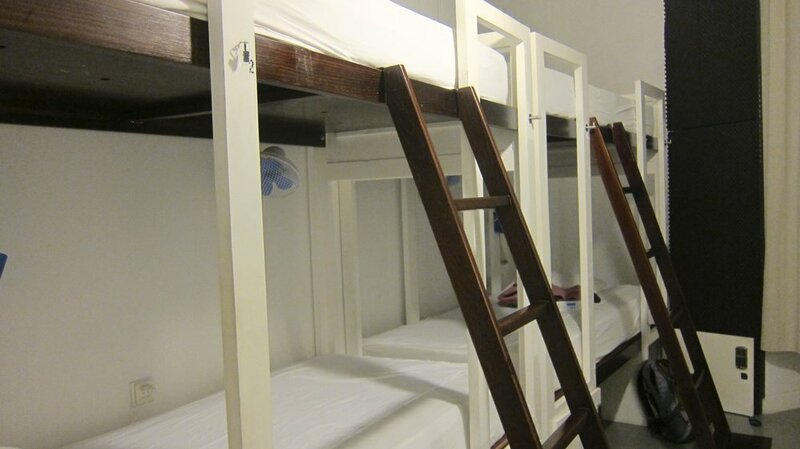 Our biggest coup was booking a four-person mixed dorm room at the Lisbon Destination Hostel for half the price of a private room and ending up with no roommates for the night. Two bunks to ourselves? Woo hoo! We ate a lot of bread, cheese and sausage in Belgium and France and cooked most of our own meals in those two countries. The one exception being my quest for the best crepes in Paris. A typical meal for us in Belgium and France. Eating out in Portugal was cheaper so we actually went to restaurants! We had some delicious meals in Portugal and it was a treat to have someone else cooking for us. We could easily eat in a nice restaurant in Portugal for 30-40 Euros or a mid-range establishment for 15-20. Like I said, it lives up to the budget-friendly hype. Trains, a plane and buses carted us across Europe and while overall expensive at $1,067, we traveled over 4,000 kilometers. At around $3 a kilometer, it doesn't sound so bad. Our long-distance travel included: -A trip through the chunnel on the Eurostar train from London to Brussles. Yes, trains don't only go from London to Paris! You can find really good deals on the train to Brussels, particularly when you book in advance and on non-busy travel days. Our one way tickets were $125 for the two of us. -Regional trains throughout Belgium and France, including a couple of trips on the TGV high-speed trains. We booked most of our train trips in advance online and printed out the tickets at the international desks of major train stations. I imagine we could have purchased most onsite, but we wanted to be sure to have seats given our tight travel schedule. On a comfy TGV train in France. -A flight from Paris to Porto, which was much cheaper and shorter than trying to travel by train. Our flight on Aigle Azur cost $115 apiece (I still have no idea what Aigle Azur is though). -Bus and train travel through Portugal. We rode Rede Nacional buses more times than I care to count, but they were a great budget way to travel throughout the country. We never paid more than 16 Euros for a three hour trip and the buses were new, comfortable and best of all - had WiFi on board. We looked into buying a Eurorail pass since we planned to continue traveling in Central and Eastern Europe, but when evaluating the cost versus the amount of long-distance travel we were really doing, it didn't make sense. Eurorail passes are charged by time frame, countries you will travel through and can incur additional seat reservation fees on some train routes. Since we were planning to travel sporadically and over the course of a few months, we opted to book trains, buses and planes on our own. I think we saved at least 30% booking our travel this way (and it provides much more flexibility to fly or take buses when we need to). We have spent $31,792 in 267 days of travel for an average per day cost of $119. Adding in major flight, long-haul transportation and visas, our grand total so far is $35,118. It is incredible that we have been able to travel for nearly nine months - all over the world - spending only around $18,000 each. Our itinerary just had us in Budapest, where we are finding even better value for our money. I can't wait to share its affordability in an upcoming post. You can see all of our budget posts here.